Evidently it doesn't take very long for somebody to realize that I enjoy playing around with recipes. Kristie invited her friend, Josh, to come to Quincy over Thanksgiving weekend. He is a college student so I assumed he should be spoiled with food when he comes to visit. We must have done all right because the next thing I know I was getting text messages from both Kristie and Josh about a Hungarian inspired cake. I knew that he would be coming back over his Christmas break so I promised that I would try the recipe out for him. I am so glad that I carried through on that promise. I had never ever seen anything like this. It kind of reminded me of curly fries in the way it was shaped. At first bite, we realized that they are very much like a crispy cinnamon roll. Next time I make them, I plan to make a vanilla icing dip to go with the special treat. Okay, so we have Hungarian dessert. It just seemed that we should try a new Hungarian entree also. I will share what I decided to make soon! Now, on to dessert. I don't even know how to type the Hungarian word for this cake so I will just use the nickname for it. 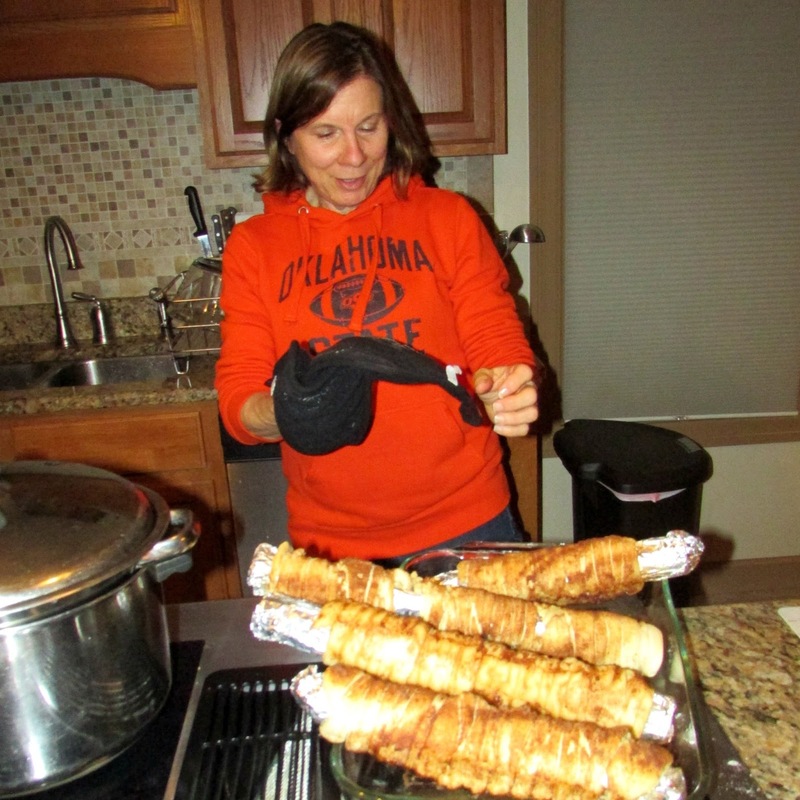 Americans call it Chimney Cake. We call it a yummy "twist" on cinnamon rolls. Add the yeast, 1/2 tsp sugar to the lukewarm milk and set aside for 5 to 10 minutes until it becomes foamy. In a large bowl, combine flour, sugar and salt. To this, add the egg, milk, 3 T melted butter and yeast. Stir the mixture until it comes together to form a dough. Knead for about 5 minutes. The dough will be sticky. Don't be tempted to add any flour. Grease your hands if needed. Transfer it to a large well greased container. Let the dough rise for 60 minutes at room temperature until doubled in volume. While the dough is rising, prepare rolling pins by covering them with aluminum foil. I used two paper rolls from the center of wrapping paper and cut them in half. Wrap them with several layers of the foil and brush them with melted butter. After the dough rises for 60 minutes, punch it down and divide it into four equal parts. On a well floured surface, spread one portion of dough and roll it into a circle(ish) 1/16th inch sheet. Using a pizza cutter, cut the dough into long ribbons spiraling around the circle about a half inch wide. Wrap one end of the strip around the rolling pin, tucking in the end so the dough doesn't unwind. Keep the dough very thin as you stretch and wind it up the rolling pin. Roll the whole thing lightly on the counter to press it together. Brush it with the melted butter and roll in the cinnamon sugar. Place in a roasting pan and bake in a preheated oven for about 25 minutes. When the cake is done, roll it in the cinnamon sugar again. Tap the mold on a tabletop to release the cake and set it upright to cool. How fun! I love trying new recipes. Anything cinnamon has to be good! Isn't it so much fun to try new things? Especially when it somebody is so excited to suggest one to you! Oh my heavens, Yum! A twist on cinnamon rolls is fine by me and you can call it whatever you want to, lol, it just looks simply spectacular! Happy Monday, hope your week gets off to a great start! We just love trying new things... and yeast dough with butter and cinnamon sugar is always a winner! It was fun to peel them apart and eat them. Thanks, Andrea! I hope you had a great weekend and a wonderful week ahead! 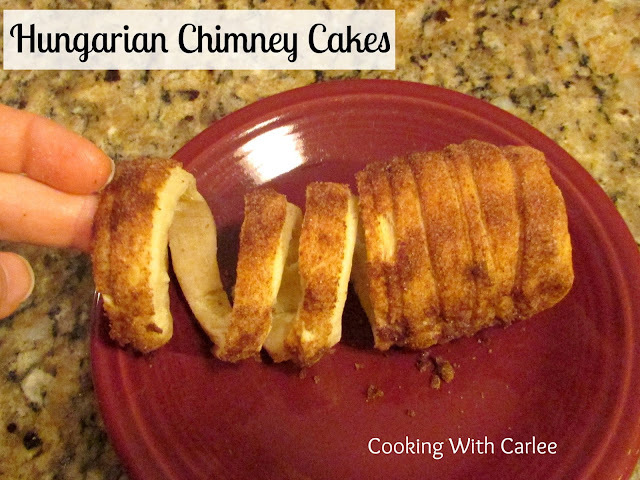 I love trying new recipes, too, Carlee, and these chimney cakes look fabulous. I can just about smell their delicious aroma as they bake! Thanks for sharing the recipe! Isn't it fun to see how different things turn out? I especially love trying foods from other regions or countries. It is fun to see how different people put flavors together. Of course if those flavors are cinnamon and sugar you know it is going to be good! These look so tasty! YUM! They were really fun to try, thanks! What a fun dessert! I have never seen or heard of this before! I hadn't heard of them before either, but they were so much fun to make and eat! My Mother in Law is Hungarian and I don't think I have ever heard her mention these. I will have to give them a try. Thanks for sharing on the Creative K Kids Linky Party this week. I hope you will join us again next week. It would be interesting to know if she knows about them! Thanks for hosting! I'm sure that you heard this over the holiday, but you are the coolest mom, EVAH!!! I love that they sent you such a complicated undertaking and you handled it brilliantly! These are so cool! I've never seen anything like them. They are the grown up version of left over pie crust with cinnamon and sugar. And way cooler!!! Haha! Thanks!! They really are a lot like that, but there is something about peeling them apart and watching them unwind that makes them so much fun! Thank you! We had been talking about them for a couple of weeks, so it was really exciting to finally make them and have them work out so well! We will just love this recipe! Hope you are having a great day and thanks so much for sharing your awesome recipe with us at Full Plate Thursday. They were so much fun to talk about and then try! Thanks for hosting, Miz Helen! What a neat idea! I've never seen anything like this before. Pinning! Thanks for sharing at Inspiration Thursday. We had the best time planning, making and eating them! I hope you do and I hope you love them! Thank you! That does look good, cinnamon, sounds like it may taste like a cinnamon roll. How delicious and different is that. It really is a lot like a cinnamon roll in a way. Just a fun variation on a similar recipe. They were so much fun to eat! Thanks, Kathleen! Never heard of it but now I want some! YUM! This looks scrumptious. Thanks for sharing at Merry Monday with us. I hadn't heard of them either until all of the emails about them started going back and forth. I am so glad we got to try them! Thanks for hosting! We were thinking we would make a cream cheese or vanilla frosting to dip them in next time, but Nutella sounds awesome too! Thank you, Dini! We eat a lot of good sweets, that is for sure! You could totally improvise too, you just have to go for it sometimes! Aren't they fun and different? Thanks for hosting! Hoe interesting! I've never seen anything like this, but it sounds yummy. It was new to us too, but I don't think it was the last time we'll be making it! That looks like a great crowd pleaser for a small party! They would be perfect for a small party! And something that would probably be new to most of your guests, which would make it even more fun!